Google this week officially launched its Hangouts Chat app, the company’s take on the booming market for chat-based collaboration. Google offered a first glimpse of Hangouts Chat almost a year ago when it announced plans to separate its original Hangouts application into two products for G Suite subscribers. Alongside a video conferencing tool, Hangouts Meet, which was made available users immediately after the announcement, a text-based Chat app was only accessible via an early adopter program. With the full launch of Hangouts Chat, Google now adds to a variety of enterprise group messaging options that have appeared in the last two years – from Microsoft Teams, Facebook’s Workplace and Cisco Spark to a range of startups. Each Hangout Chat room can support up to 8,000 users and is available via browser and mobile devices, with support for iOS and Android. There are built-in compliance features to meet data retention, eDiscovery and regulatory demands for large businesses, thanks to Google Vault. For companies, it is important not to get caught up in a side-by-side, checklist comparison of features from the various platforms, according to Alan Lepofsky, vice president and principal analyst at Constellation Research. 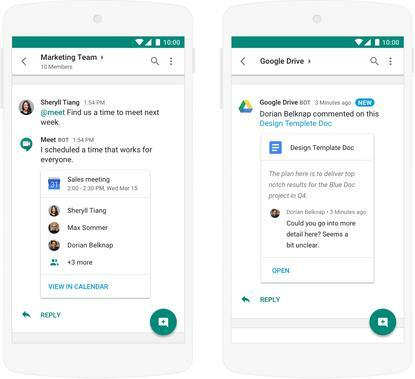 As with Microsoft Teams and Office 365, Google’s Chat is tightly integrated into its G Suite portfolio, which includes Drive, Calendar, Sheets and Slides. It is also possible to jump quickly from Chat into a Hangouts Meet video call. So, just as Teams is a natural fit for Microsoft customers, “Hangouts should appeal to existing G-Suite customers,” Lepofsky said. He added that the challenge for Google to grow adoption will be more a cultural than a technical one. “Similar to Google+, it’s not features that will drive adoption, but rather establishing a large and loyal customer base, then being able to get those customers to push usage to their external partners,”said Lepofsky. Another challenge Google faces is getting business partners to create third party add-ons. One of the key features of the new crop of collaboration tools is the ability to hook into other applications. This has been a particular strength for Slack, and last week Atlassian announced that it had opened its Stride API for developers to create apps. “For products to win in the market, they need an ecosystem, not just native features,” said Lepofsky. Chat will launch with 25 bots to help speed up business application workflows. Zero, Egnyte, Zoom.ai, Trello, Jira, and Wrike are among those available at launch. Another important integration is with Salesforce’s customer relationship management software. “Hangouts Chat has to come down into the flow of how people work, so the G Suite and Salesforce integrations will be key,” said Smith. As well as third-party applications, bots that integrate with Google’s own suite of applications are available. For example there is the @Drive bot, which lets users know when Google Docs files are shared, when comments are made or when there are requests to access content in the document storage platform. Another bot, @Meet, integrates directly with Google’s Calendar app to schedule meetings. Google is also launching a bot creation platform to let more third-party firms build their own integrations. Alongside the Hangouts Chat announcements, Google also unveiled new artificial capabilities (A.I.) for products in G Suite. The Calendar app now uses machine intelligence to provide “automatic room suggestions when you create or edit an event, optimizing the room-booking process and saving you time,” Google said. 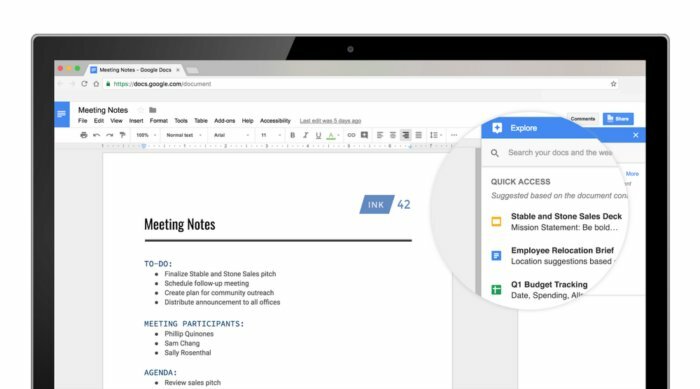 A Quick Access feature, similar to the feature with Google Drive, uses A.I. to surface related files within Google Docs. Quick Access in Docs uses artificial intelligence to suggest relevant files based on signals like Drive activity and information in documents.